Over time Bob taught himself electronics, mechanical engineering, and patent law. And from what started as a wood block prototype, Bob’s original vision began to take shape. “I made a couple of prototypes and showed them around and eventually certain musician friends of mine wanted one of their own. So, I patented the whole “Visual” concept for pedals (another learning curve) and at the January 1995 NAMM show, I jumped into business with one product… the Visual Volume™.” That was the start of Visual Sound, now known as Truetone. Since that time, Visual Sound continued to grow, finally becoming Truetone in 2015. Now, with a bright future ahead, Bob and his staff are creating new products that will establish Truetone as a cutting edge music company far into the future. Following a 30 year career with IBM, R.G. brings a vast wealth of knowledge to Truetone for product development. 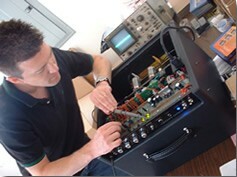 Well known throughout the boutique and DIY communities for his geofex.com website, R.G. is known by many as the Godfather of Boutique. Zac is an accomplished guitarist himself – playing with the likes of Vince Gill, Alison Krauss, Brad Paisley and Buck Owens, among others. After graduating from Belmont University in Nashville, Tennessee, he studied for a year at the Sorbonne in Paris. In addition, Zac was the long-time guitar tech for Brad Paisley, as well as Terry Clark and Carrie Underwood’s band. Along with his tech work, Zac is been a contributing columnist for Vintage Guitar magazine. Steve was a touring musician for many years, backing up artists like Michael Card, Wes King, and many others. Also having worked in retail music stores, Steve is able to provide support to Truetone dealers throughout North America. Dana has worked both in music retail and as a touring musician (Sonic Flood, Geoff Moore, etc.) and brings his vast knowledge and skill to Truetone in overseeing all of our Service Operations and meeting the needs of our customers. Need support? Go here. Bob’s older brother relocated from Connecticut with his family in 2005, following Michael’s 18 year career with Boardroom, Inc. Michael’s expertise in marketing and organizational detail helps Truetone to continue growing, impacting the musician marketplace and beyond. Mike gets the devil out of the details so the rest of us don’t have to worry about it. Bob’s mom is not only Bob’s mom, she becomes everyone’s mom at Truetone. She keeps the accounts balanced, processes orders, and tries to keep everyone’s head on straight. Known by many as the lead singer of the band “Guardian”, Jamie is known to his friends at Truetone as the social media guru and high-intensity marketing guy. 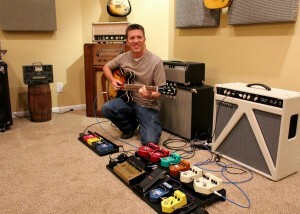 Joining the TT ranks in early 2012, Jamie has his sights set on getting every guitar player on the planet into Truetone. Ben is gifted at working with computers. Whether he’s programming a new database from scratch or helping someone with a computer migration, Ben’s unique skill-set is appreciated in the office.